(2004), pp 374, 9 maps, 16 col. & 45 b/w illust., 25 x 17 cm, paperback. ISBN 0-9518382-4-5. "This detailed study of a small area of the Mersey basin in north Cheshire makes a vital contribution to one of the greatest historical debates. The implications of Charles Foster's ground-breaking book lift it far above the level of local history, though it is a masterly example of that too. Based on sixteen years' research into four centuries' worth of original documents, Charles Foster's book combines the broadest and boldest of sweeps in his conclusions with the best sort of in-depth study, that gets down to the grass-roots level and allows him to introduce real individuals and families into his account." Foster argues that, in the sixteenth century, there was a major redistribution of wealth away from the Church, the Crown and the major gentry. As a result a business society emerged in the North-West of England in the seventeenth century. Changes in property law, the great inflation in land values and the pastoral agriculture in that area meant that a large number of families of the middling sort were able to pass on a bit of capital to each of their children. Many of these children then moved into trade and manufacture, or paid their passage across the Atlantic to set up in business in the northern colonies of America. With so many small property owners in the area, landowning gentry did not dominate local society as they did in the South and East of England. So the 'business' culture of the North-West and of America was able to withstand the 'gentry' culture of the South of England and the rest of Europe. The great expansion of trade around the Atlantic, in which sugar, tobacco, cotton, timber and grain were exchanged for English manufactures, created so much wealth that some of the rich businessmen in the North-West were willing to venture their capital to develop the canal system, mechanical spinning and an effective steam engine - the innovations that drove the Industrial Revolution. Few other historians have studied such a small area over such a long period and Foster‘s tenacity in searching out every possible archival source has reaped rich rewards. He clearly demonstrates that the new manufacturers belonged to town based business families and were not, as previously believed, the offspring of yeomen farmers. Apart from its intellectual strengths, the book has other delights. It is written in an easy-to-read prose style and interest is maintained, even in the most difficult chapters, through lively vignettes of the most prominent families and individuals discussed. The book is richly annotated and beautifully illustrated, containing a large number of photographs, family trees and maps, which help the reader to understand the various views advanced. 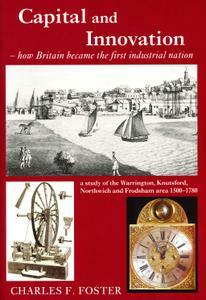 All in all, this is an important piece of work which should be read, not only by those who study North-West history, but by anyone interested in why and how Britain became the first industrial nation. David Sunderland, University of Manchester. The traditional interpretation of the Industrial Revolution sites it within Lancashire and dates it from the decades of the 1760s. In a pioneering new study, Charles Foster sets this tradition in a much longer time perspective by tracing the rise of a business society back to the 1540s and by reasoning that such a phenomenon was an essential prelude to the Industrial Revolution proper. As a socio-cultural explanation of the origins of that revolution his work does seem more convincing than that of any other scholar, including H.J. Perkin. His work is unusual insofar as it is the product of a retired business man and may be compared in that respect only with the work of W.R. Scott (1848-1940). It forms the fourth and final volume in the Arley Archives series. Together the four volumes represent an important contribution to the history of the region. This particular volume will be widely welcomed because of its breadth of perspective, its meticulous scholarship and its cogent analysis. D.A. Farnie, Manchester Metropolitan University.